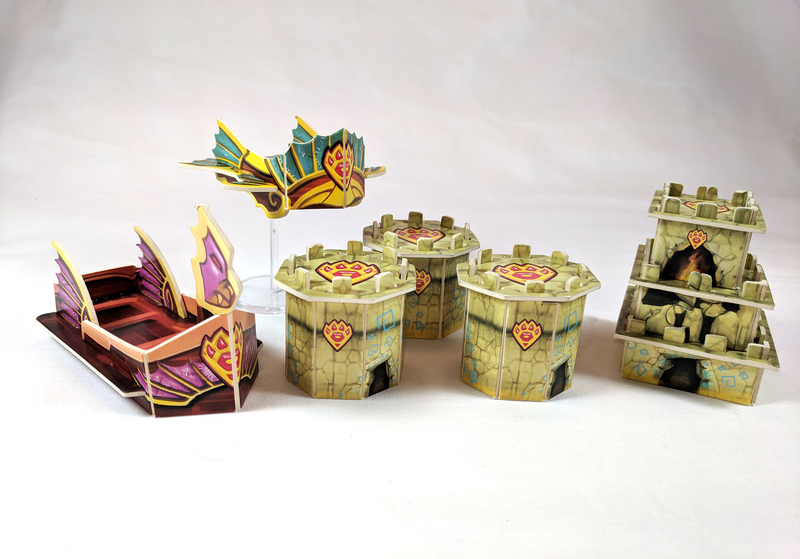 Gamelyn Games is known for their ‘Tiny Epic’ series designed by Scott Almes (read our review of Tiny Epic Quest). 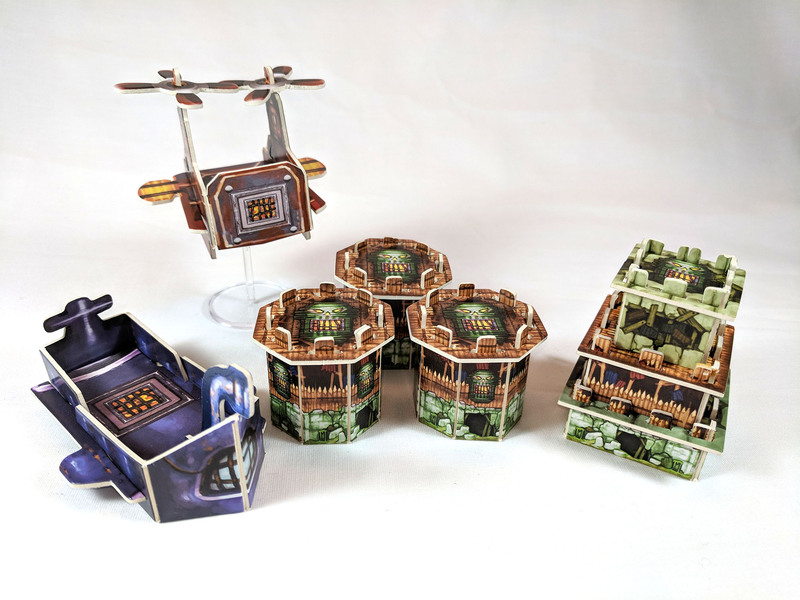 These games are easy to carry, quick to pick up and play, but feel big and robust in terms of strategy and theme. 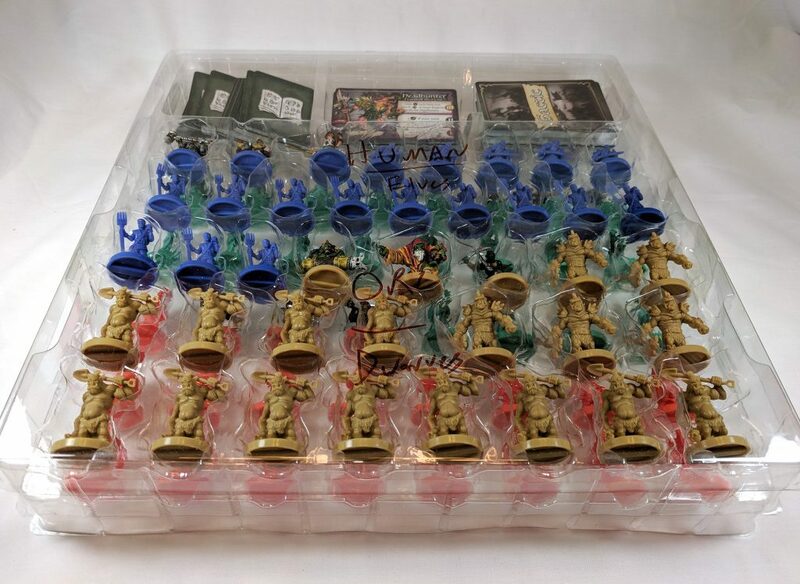 They have a good thing going with this idea and have recently had two very successful Kickstarters for other ‘Tiny Epic’ games; Defenders and Zombies. So, in all honesty, I don’t know what led to the madness that is Heroes of Land, Air and Sea. Don’t worry about the missing Oxford comma in the title, I’m going to review the game not their writing style. 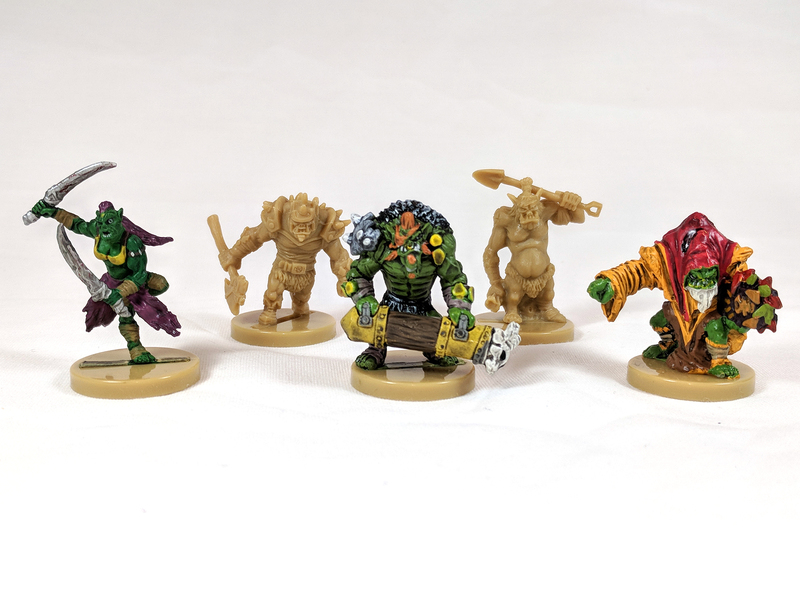 We’ll be looking at the contents of the base game and the first expansion, Chaos and Order (not the mini expansions: Nomads, Mercenaries, or Siege Weapons) in preparation for their newest Kickstarter starting tomorrow for another expansion called Pestilence. 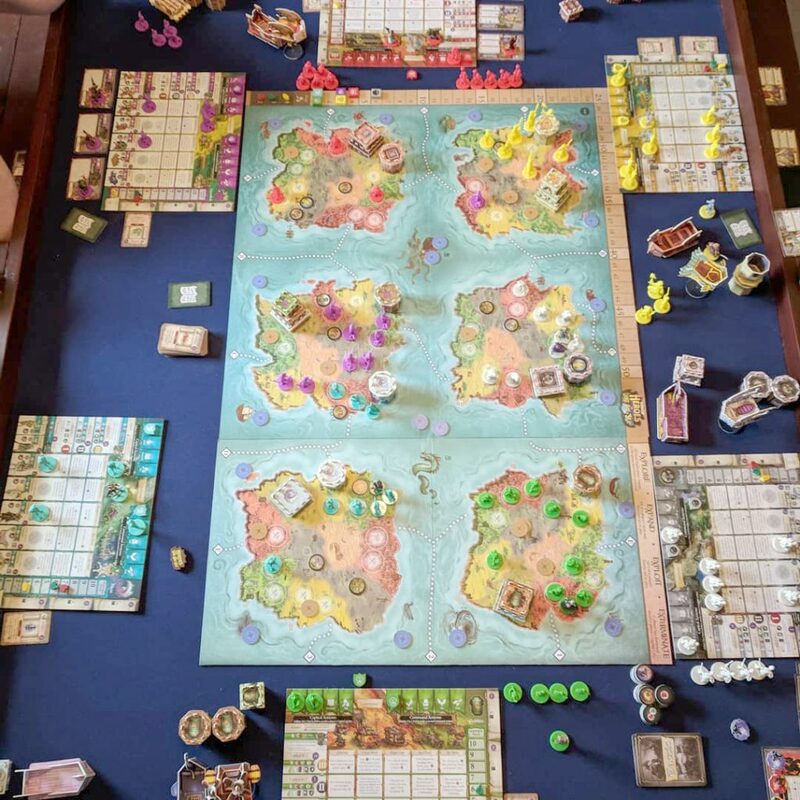 This is a big 4X game and looks tremendously attractive but is it for you? Read on to find out. You win HoLAS by having the most victory points at the end of the game. You earn these victory points through constructed buildings and towers, upgraded city, occupied Land Regions (small areas that make up a continent), scribed or casting Spells, units recruited, and battles. Most of these Victory Points are tallied at the end of the game but two of them occur during play: participating in battles and casting spells. These actions allow you to do all sorts of things with your faction: unit deployment, construction, recruitment, scribing and casting spells, or gaining resources. Each player takes one action in order, then after you’ve gone around the table twice everyone collects resources. Keep in mind, that if another player takes a Capital Action any other player can follow that action by using a serf from their player board. You don’t have to go in turn order when following. This is a unique mechanic that a lot of Gamelyn Games’ games employ to make sure all players are involved and active. After turns have gone around twice pass the First Player Token and repeat until you’ve triggered one of the end game conditions. eXterminate – a player has destroyed another player’s Capital City. Why 4X and not 4E, we may never know. HoLAS claims it is a 4X-style game but it is using a very broad definition of 4X to make that claim. While it is described as such some may disagree with the authenticity of it’s claim because it does not have a robust kingdom building option or dynamic economy, no diplomatic interactions, nor is it played on a global (this is arguable) or galactic scale, like Civilization or Twilight Imperium. I would probably define it more as a turn based strategy simulation; think Warcraft. If someone is looking for a larger longer game like the aforementioned 4X games, this might not fulfill their requirements, but it’s not the game’s intention either. Perhaps 4X-light would be a better description. Let’s move on to the reviewy part of the review. There are a lot of things I love about this game and some things could be improved, clarified, or addressed by different means. Let’s break this down into a few manageable chunks and see where we get before the TL:DR at the end. The beginning of the book presents you with a one page component overview with a brief description of all the pieces followed by game setup and game area explanations. The detailed instructions are broken down by each action type then explained fairly thoroughly. However, there are a lot of little paragraphs that if missed can dramatically change play. 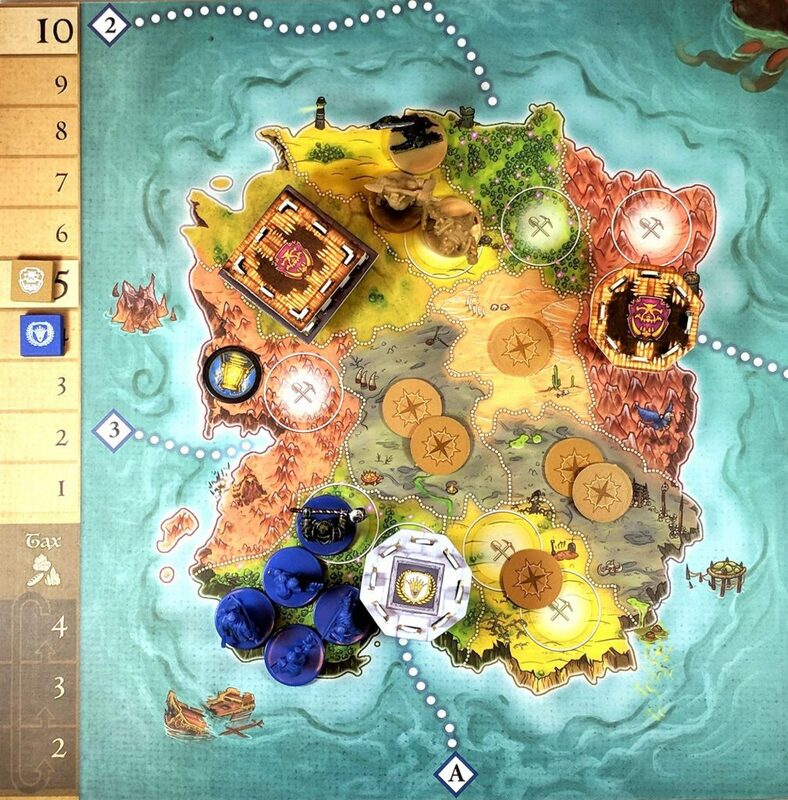 For instance, on my first playthrough with a group (I had already played a solo game and felt pretty comfortable with the rules, I was mistaken) I missed the little blurb explaining that the ferry routes (dots) between continents and that led to graticules (numbers and letters) at the edge of the board in the sea territories actually connected the continents and could be ferried (marched) across without using a vessel. This explanation is found under the march action description but I missed it and it changed how players explored and built. I would recommend a couple good read throughs and then watching a video or two. 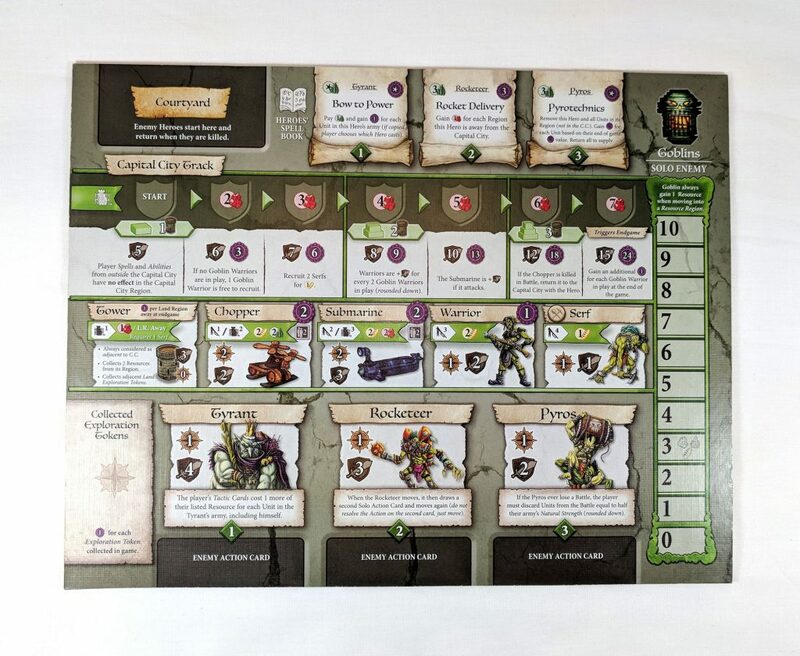 There is a convenient separate page that contains the explanations of the exploration tokens on one side and a truncated review of the 4X objectives, playing a round, the game board and each action. I found the instructions to be thorough but a bit overwhelming. It’s organized well but there are so many short explanations of different actions, units, and pieces that it can come across as disjointed and jarring during an initial read through. What the instructions cannot do is account for the myriad of faction and hero abilities and those are what presented the real challenge with the rules. In a game like this the rules are there as a starting place and all the abilities go beyond or break the rules. None of the abilities are covered in the instructions. Thankfully the team behind the game is very active on forums answering questions and solving problems but there is no official FAQ. This may or may not be your cup of tea but it is a fun and interesting little addition. The game takes place in the once peaceful and prosperous land called Aughmoore. The land’s magic is waning and resources are scarce. This causes mistrust and self isolation between the factions and now they no longer work together but are caught in hatred and war. At the end of the book is a bit of faction lore for each faction. Also, each hero is named with some interesting story information on the back of their character card. It’s a very simple generic fantasy world with a not unique story placed on top. It is, after all, a game of conquering and destruction. 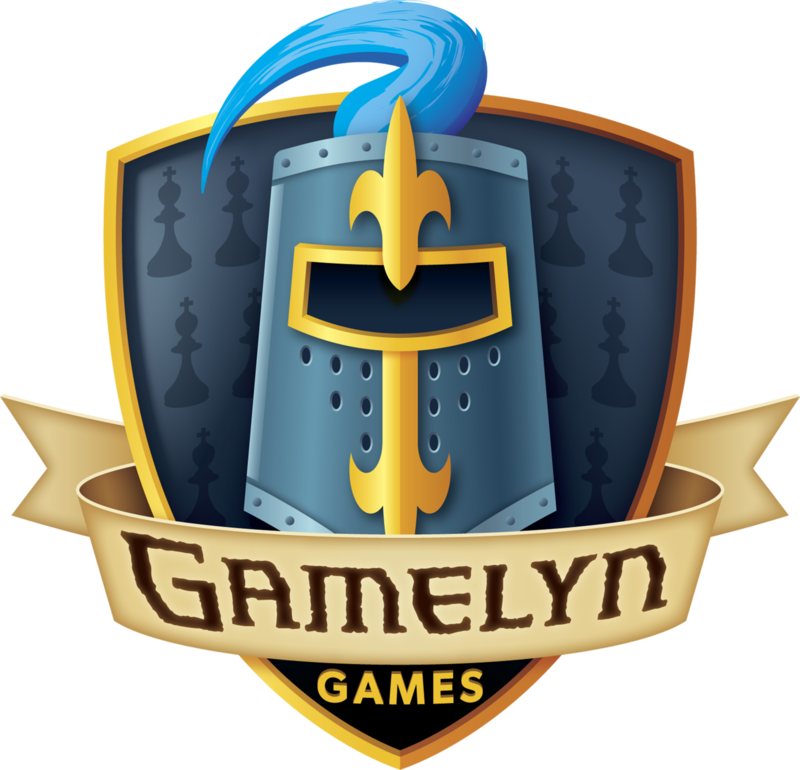 Most people are not planning to get invested in the character development but it shows that while Gamelyn Games wanted to create a good, solid, game they enjoyed developing a little history and flavor on top. Perhaps it could inspire some short stories or could be used as a setting for a homebrew RPG. One cheesy part of the instructions, located in the lore, is that you are supposed to read the victory lore of the winning faction out loud. Be careful not to rub in your victory too much. This game has tremendous table presence. Once you’ve played a few rounds, sit back and take a look at what you and the other players have created, it’s quite beautiful. 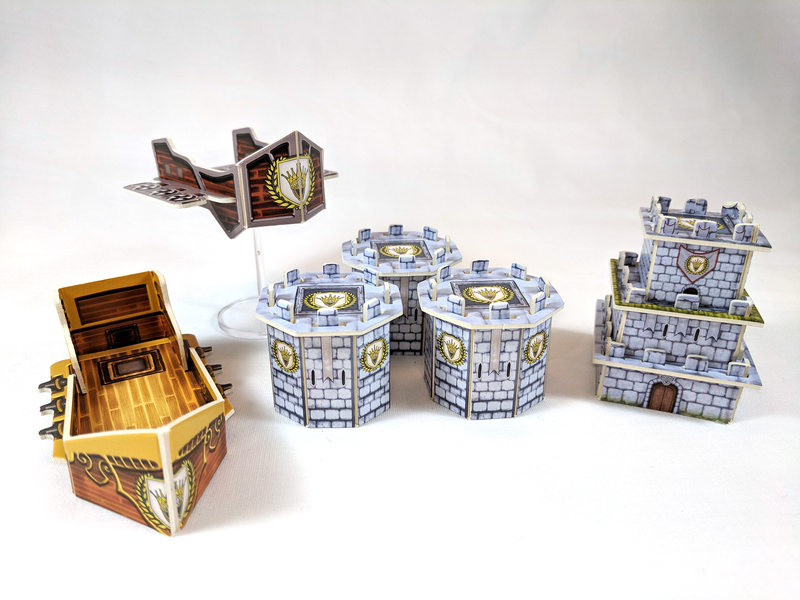 The vibrant colors, the unique buildings and ships with the faction crests, and the miniatures of each faction draw you into the fiction of the world you are creating as the events unfold before you. 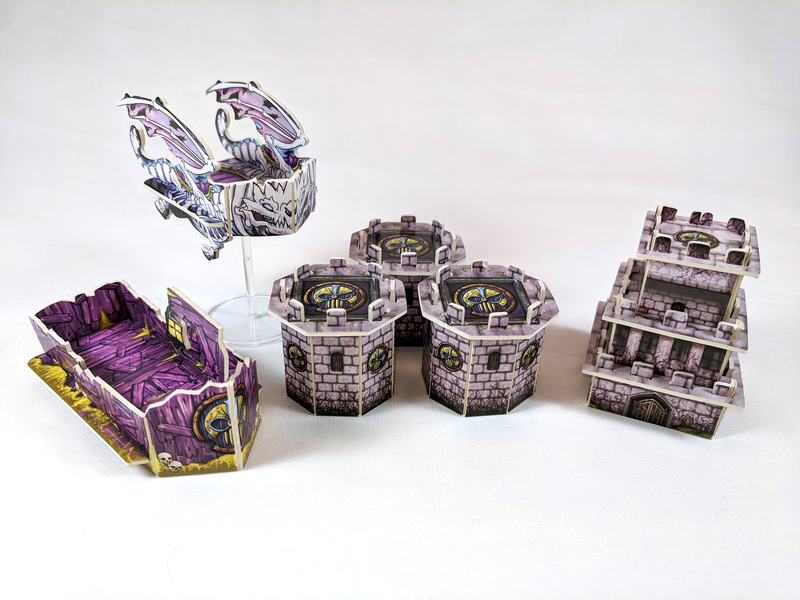 I saw this game on the table last year at Gen Con and crowds stopped by to wonder at the large map full of towers, cities, flying ships, and colorful minis. That’s all well and good, to have a large visually stunning game, unless you have a smallish table. The base board is 26in x 26in and the first expansion is 13in x 26in. Oh, don’t forget each faction’s Capital City board at 11.5in x 9in. Wait, there’s more! 3 Hero Cards, 7 Tactic Cards, 20 units, and 8 constructs: buildings, towers, and ships. When I say this game has table presence I really mean it’s going to devour all the open space on your table. Don’t bring drinks near my game why do you have a plate of food keep the children away no, dear god, not the cat. 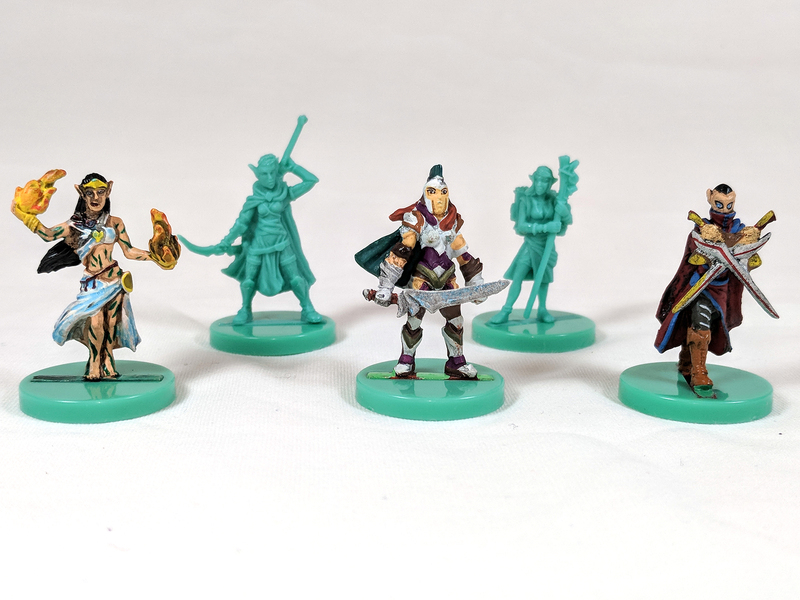 The base game, for up to four players, has four factions, Humans, Dwarves, Orcs, and Elves. 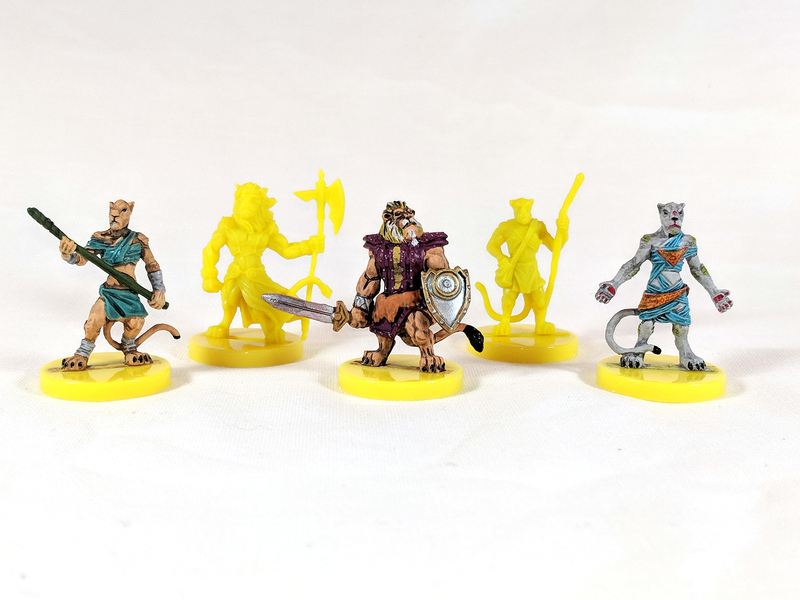 The first expansion, Chaos and Order, adds two more players, and four more factions; Undead, Goblins, Lionkin, and Lizardfolk. 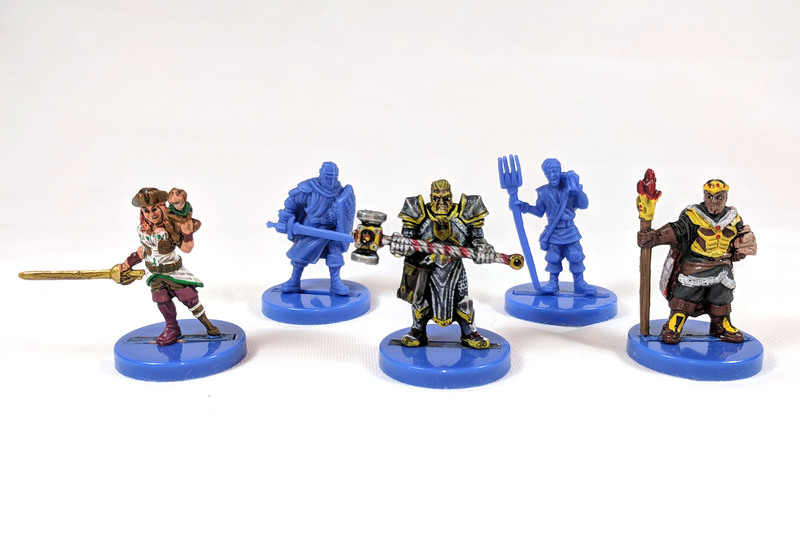 Each faction has its own color theme, its own design for buildings, vehicles, serfs, warriors, heroes and cards, and a Capital City board with all the special information regarding abilities. Each faction’s abilities are unique and if you do the math (it’s not that difficult) there are a total of 192 different abilities across the 8 factions. This does not include the nomads or mercenaries you could add from the mini expansion, which adds 21 more. Overwhelmed yet? Because of so many unique abilities and units the strategies to play the game are innumerable. The down side to all these abilities is that they wreck the rules, not in a real bad way, that’s the point of special abilities, right? However, you either need to house rule how some abilities interact or use an unofficial FAQ. Battlin’ ain’t easy. The order of operations can be hard to follow once you add in all the special abilities. (Remember how awesome I said they were? Well, sometimes they can be frustrating) Once an army enters the region of another army they have to fight. They have to, that’s the rule, unless you’re playing the team variant where you can share resources and land regions. 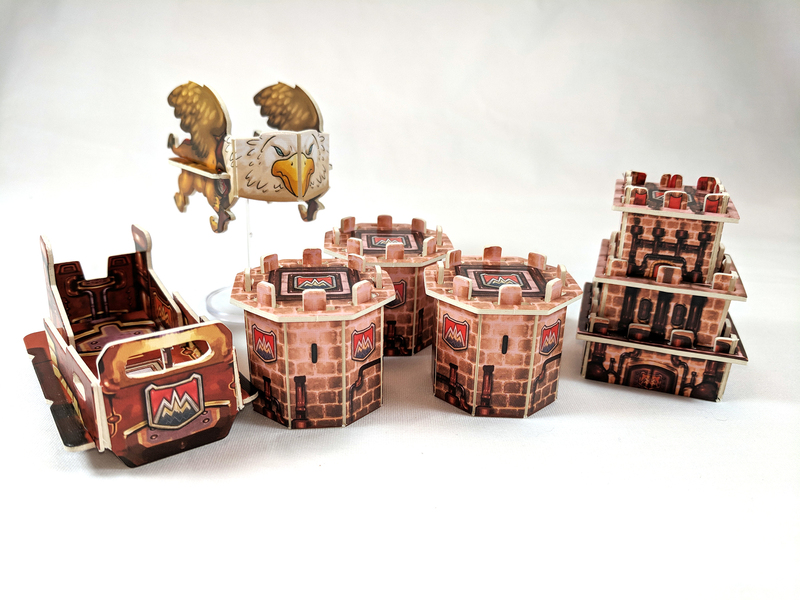 Once you total up the strength of each army and use special abilities, each player picks a Tactic Card from their hand. Tactic Cards give you a number of different choices like retreat, conscript, charge, etc. Some give bonus strength, all affect victory points, and each has a cost in resources: food, ore, mana, or units. But here’s the kicker, it’s like a 7 way Rock-Paper-Scissors game because some Tactic Cards cancel out others or can provide bonuses versus others. It can get pretty tense but if you play cleverly and pay attention to the resources your opponent has then playing the right card can be very rewarding. That’s about how I felt the first couple times I played; What is time anyway? The designers ‘suggest’ 2-3 hours, depending on player count. But, as you gamers know, the first couple playthroughs can easily double that amount. So, it’s best to make all your friends watch some videos, read the instructions, pick a faction, memorize the abilities, and sign a contract stating they won’t leave early before you begin play. And if you introduce a new player into a group of veterans…go gentle on them, it’s easy to get lost. Honestly, it’s not that bad with a group of people who are familiar with the game. Of course the more people you add the longer it’ll take. Just keep a taser on hand for the players who take too long. This one can be a bit of a mixed bag. The end game triggers when one of the 4X conditions are met. Some of them sound easy and look tempting to try and rush. But if you end the game quickly your friends may not appreciate wasting the 45 minutes they took organizing their play area and you might not even have enough Victory Points to win! Also, the last X is eXterminate. That means it removes a player from the game and they lose all their victory points. They don’t just lose them, they are eliminated from the game. This could be a bit frustrating and disappointing after a good intense long game. Granted destroying another player’s Capital City isn’t easy to do but it is rewarding and mean. But why are you playing a war game if you can’t handle a little meanness? Between the abilities, the spells, the different units, and the Tactic Cards, this game is full of strategy. Every faction can be played differently each time. With this variety it’s easy to see how this game could have loads of replayability. I have yet to personally play with every faction, although I have seen each faction in play. Several times I’ve watched a faction get left behind in resources and they have had a difficult time catching up. The only real catch up mechanic that I’ve seen is to play defensively and collect resources but that is not a winning strategy because you must participate in battles to earn Victory Points during the game. What some may like about HoLAS is that there isn’t much hidden information: players have full access to the faction ability information for other players, you can see the spells that your opponents have scribed, and you know what Tactic Cards everyone has (they’re the same for everyone), so if you’re clever and patient you can form an effective strategy. The only real hidden information is spell cards in the players’ hands and what Tactic Card they will play, but if you pay attention to their resources you can narrow it down. 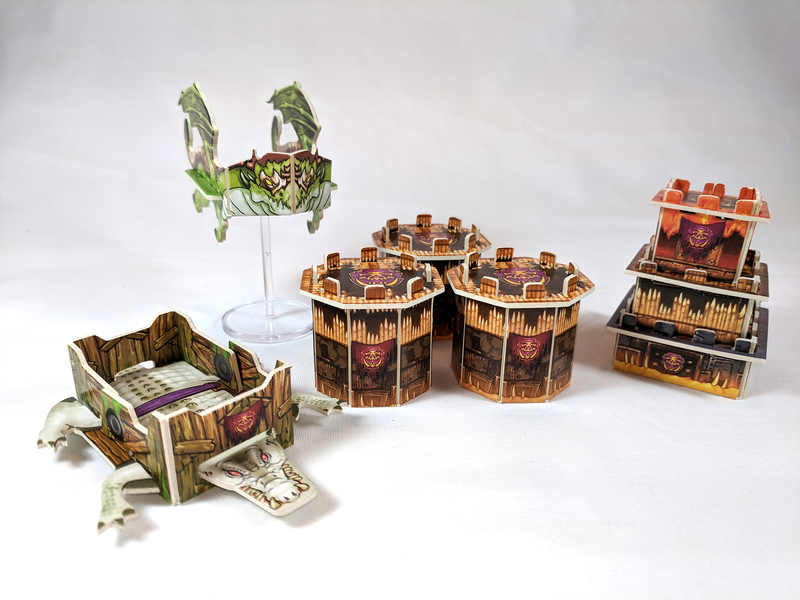 This leaves a very small amount of luck on the table: namely in the form of Exploration Tokens that you reveal when you march your army across the regions. You can also reveal many of them by building a Tower. It doesn’t leave many things to chance just resource management and strategy. 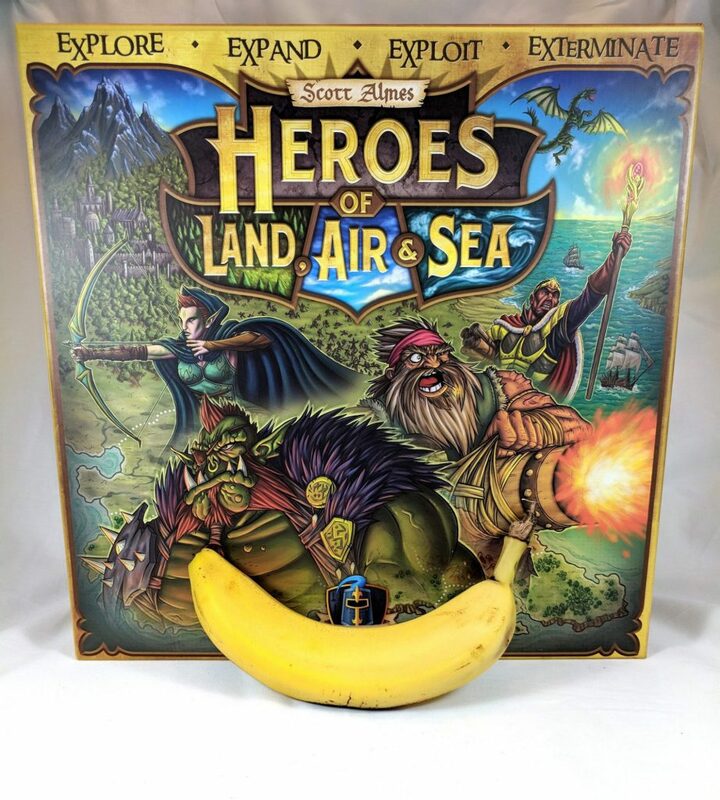 Heroes of Land, Air and Sea is a big box with a big board and lots of pieces. But are they worth it? I’d say, “Yes!”. 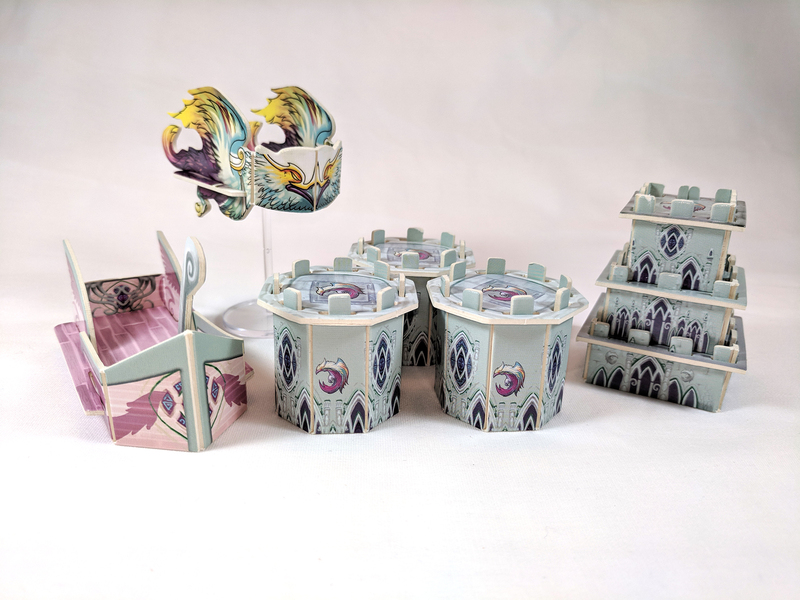 I’ve already mentioned many of the pieces and their sizes and the good news is that they are quality pieces. 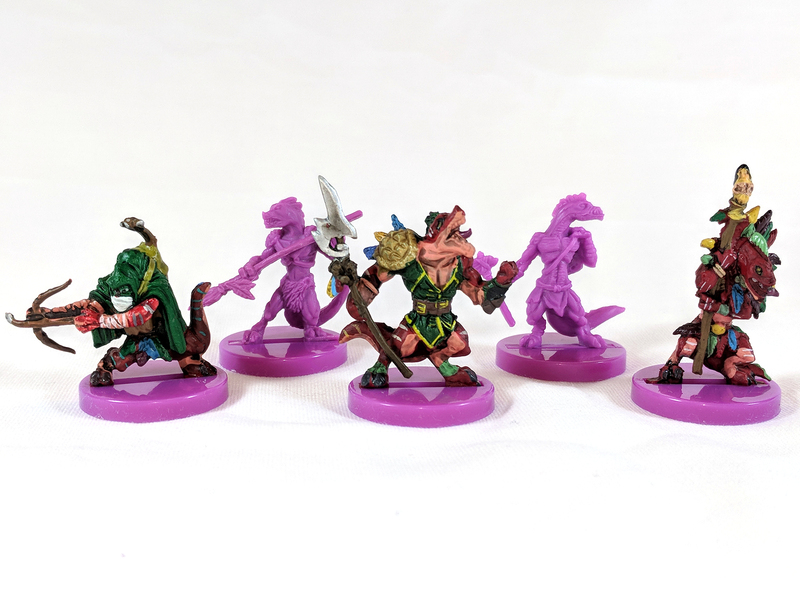 The minis are all unique colors, which might be frustrating if you’re (slightly) colorblind like me; it can make distinguishing between some of the Victory Point Tokens and some of the minis difficult. 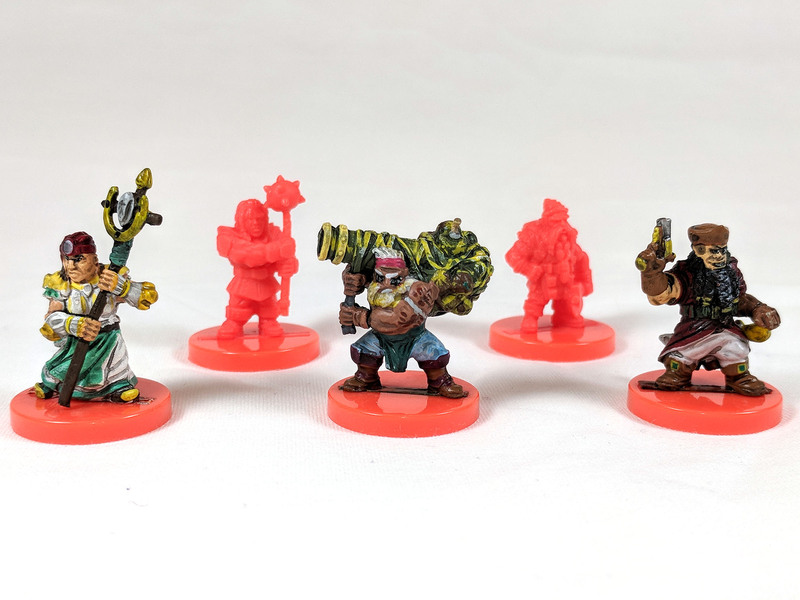 Each faction is designed slightly differently: The serfs and warriors and heroes are carrying different weapons and posed in different battle positions. 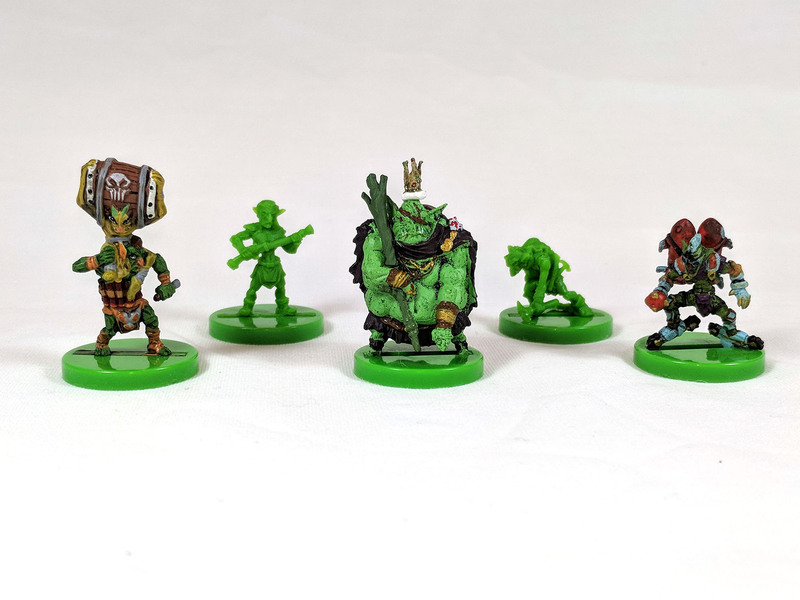 When I Kickstarted the game I splurged on the painted heroes and I’m glad I did. It really makes them pop on the board against the monocolored serfs and minis of their faction. It’s easy to recognize other players pieces and identify when you might be going up against something you can’t handle. In the boxes are also 64 buildings and ships that you have to put together. It took me about 3-4 hours to do all eight factions but I wasn’t in a hurry. They go together very snuggly and stay together well. I did run into a small amount of peeling when placing bits into their appropriate slots. This is nothing a little paper glue can’t fix and I kept an exacto knife on hand to help ease the parts into the tight spaces. After playing several games and traveling a few times with the boxes I have yet to have something break. Some of the ship pieces can slide off easily but they quickly go back on, no problem. And conveniently everything fits in the boxes without having to deconstruct anything. Pro tip: label where the units from each faction go because if you forget it’s just a guessing game. Since you’ve made it to the end I’ll gift you with some final thoughts. I really like this game, obviously. Part of it might be because I Kickstarted it and invested a bit of money but most of it is because of the game itself. Heroes of Land, Air and Sea is a very enjoyable turn based strategy game with 4X tendencies. This may turn some fans of ‘true 4X games’ away and that’s a fair judgement against HoLAS. I like that things feel like they move quickly even if the game itself runs a few hours because of the ability to take actions outside your turn. Battles can sometimes be a bit tedious when multiple heros and/or vessels are in the fray but players must remember to be patient with each other. 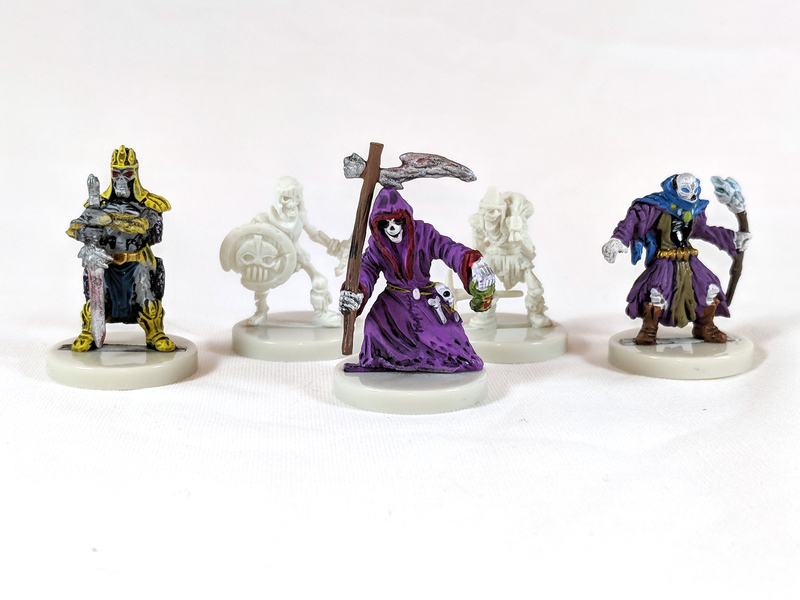 The art and minis are captivating and contribute to the game’s beauty when laid out on the table. The replayability is huge because of the number of factions, and strategic approaches. 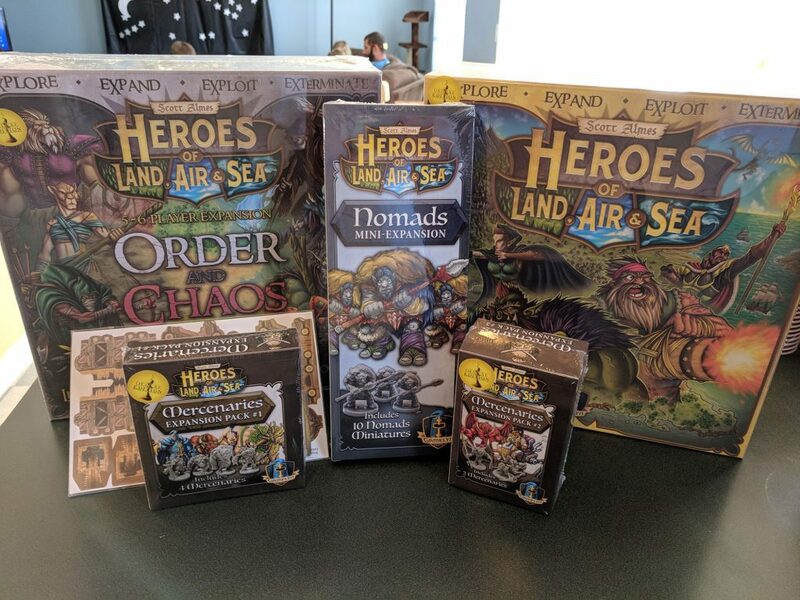 If you’re not into the huge and time consuming “true” 4Xers like Twilight Imperium, Space Empires, or Through the Ages but like something a little lighter with 4X themes then Heroes of Land, Air and Sea is an excellent game to put on your shelf. Or maybe next to your shelf. It really depends on how big your shelves are because seriously…it’s a big box. 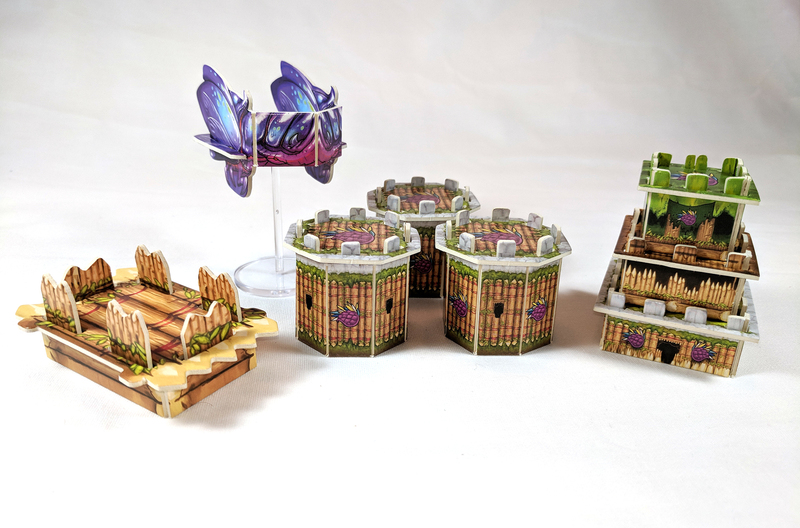 Get ready for another expansion Kickstarting tomorrow: Heroes of Air, Land and Sea: Pestilence. This big box adds Birdfolk, Merfolk, a flying continent, a sunken continent, more spells and exploration tokens, and a 7th player. I’m going to need to apologize to my wallet, my game table, and family. Bob Ross: The Art of Chill Review – Happy Little Trees Means Happy Little Life!